Scenic cross-country skiing at its finest can be found in all areas of the county. No matter what your skill-level is, you can find the kind of skiing experience you are looking for at one of seven trails. Seventy-five kilometers of trails are available and can be skied in either classical or skating techniques. Brandt Pines Located west of Grantsburg. Contact the WI DNR for trail conditions. (715)463-2898. Forts Folle Avoine Historical Park The Forts are located just 3 miles west of State Highway 35 between Danbury and Webster. For trail conditions visit web site or call: (715) 866-8890. Email Forts Folle Avoine. 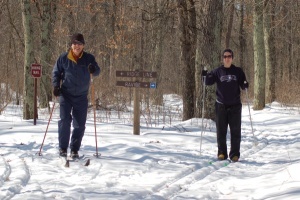 Grantsburg Nordic Trail. Located in the village near Memory Lake. New Trails have been developed in 2014. The trail system has been redesigned with 4 miles of groomed trails. The goal is to have 11 - 12 km of trails. Hay Creek at Crex Meadows is 1.5 miles long. Contact the Crex Education Center for trail conditions. (715) 463-CREX. Upper Phantom Lake trails at Crex Meadows is 3.7 miles long and is located north of County Road D on East Refuge Road. Contact Crex Meadows Education Center for trail conditions. (715) 463-CREX. Grettum Flowage at Fish Lake Wildlife Area. This trail is 4.5 miles south of Grantsburg on Hwy 48/87. Sand Rock Cliff For Trail conditions contact the WI DNR at: 715-463-2898. Voyager Village Trail conditions Located on Kilcare Road Between County Road A (North Sand Lake) and Webb Lake. Webb Lake Ski Trail is located 13 miles east of Danbury. Located on North Bear Lake Road, you can access it off of County Highway H between Webb Lake and Hwy 77. Trails maintained by Webb Lake Men's Club. Finish off a day of cross-country skiing with a stop at an area coffee shop or restaurant. Check out our Lodging and Dining, Food, and Beverage directory for a destination near your trail.